It has been requested that the title of this article be changed to List of governors of Alabama. Please see the relevant discussion on the discussion page. The page should not be moved unless the discussion is closed; summarizing the consensus achieved in support of the move. The Governor of Alabama is the chief executive of the U.S. state of Alabama. The governor is the head of the executive branch of Alabama's state government and is charged with enforcing state laws. There have officially been 54 governors of the state of Alabama; this official numbering skips acting and military governors. The first governor, William Wyatt Bibb, served as the only governor of the Alabama Territory. Five people have served as acting governor, bringing the total number of people serving as governor to 59, spread over 63 distinct terms. Four governors have served multiple non-consecutive terms: Bibb Graves, Jim Folsom, and Fob James each served two, and George Wallace served three non-consecutive periods. Officially, these non-consecutive terms are numbered only with the number of their first term. William D. Jelks also served non-consecutive terms, but his first term was in an acting capacity. The longest-serving governor was George Wallace, who served 16 years over four terms. The shortest term for a non-acting governor was that of Hugh McVay, who served four and a half months after replacing the resigning Clement Comer Clay. Lurleen Wallace, wife of George Wallace, was the first woman to serve as governor of Alabama, and the third woman to serve as governor of any state. 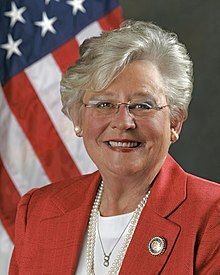 The current governor is Republican Kay Ivey, who took office on April 10, 2017 following Governor Robert J. Bentley's court-mandated resignation following a guilty plea-deal amidst a corruption scandal. She is the second female governor of Alabama. Alabama Territory was formed on March 3, 1817, from Mississippi Territory. It had only one governor appointed by the President of the United States before it became a state; he became the first state governor. Alabama was admitted to the Union on December 14, 1819. It seceded from the Union on January 11, 1861, and was a founding member of the Confederate States of America on February 4, 1861. Following the end of the American Civil War, Alabama during Reconstruction was part of the Third Military District, which exerted some control over governor appointments and elections. Alabama was readmitted to the Union on July 14, 1868. The first Alabama Constitution, ratified in 1819, provided that a governor be elected every two years, limited to serve no more than four out of every six years. This limit remained in place until the constitution of 1868, which simply allowed governors to serve terms of two years. The current constitution of 1901 increased terms to four years, but prohibited governors from succeeding themselves. Amendment 282 to the constitution, passed in 1968, allowed governors to succeed themselves once; a governor serving two consecutive terms can run again after waiting out the next term. The constitution had no set date for the commencement of a governor's term until 1901, when it was set at the first Monday after the second Tuesday in the January following an election. However, the Alabama Supreme Court ruled in 1911 that a governor's term ends at midnight at the end of Monday, and the next governor's term begins the next day, regardless of if they were sworn in on Monday. The office of lieutenant governor was created in 1868, abolished in 1875, and recreated in 1901. According to the current constitution, should the governor be out of the state for more than 20 days, the lieutenant governor becomes acting governor, and if the office of governor becomes vacant the lieutenant governor ascends to the governorship. Earlier constitutions said the powers of the governor devolved upon the successor, rather than them necessarily becoming governor, but the official listing includes these as full governors. The governor and lieutenant governor are not elected on the same ticket. Alabama was a strongly Democratic state before the Civil War, electing only candidates from the Democratic-Republican and Democratic parties. It had two Republican governors following Reconstruction, but after the Democratic Party re-established control, 112 years passed before voters chose another Republican. (term limited) Democratic 1910 Walter D. Seed Sr.
^ Records are scarce as to when Bibb was actually appointed. The territory was formed on March 3, 1817, but he was appointed by President James Monroe, who did not take office until the next day. Other resources indicate that other major appointments for the territory were made on March 6, 1817. ^ a b Bibb was inaugurated on November 9, even though Alabama did not formally become a state until December 14. ^ Data is sourced from the Alabama Department of Archives and History, unless supplemental references are required. ^ Repeat governors are officially numbered only once; subsequent terms are marked with their original number italicized. ^ The office of Lieutenant Governor was created in the 1868 constitution, abolished in the 1875 Constitution, and recreated in the 1901 Constitution. ^ Sources are evenly split on if Bibb died on July 9 or 10; the Alabama Department of Archives and History says July 10. ^ a b Multiple sources state that Thomas Bibb did not succeed William Wyatt Bibb until either July 15 or July 25. It is unknown if this was the formal inauguration, or if a vacancy existed in the office; it is assumed that succession was automatic, as per the constitution, and that Thomas Bibb's term began on July 10. ^ Moore resigned to take an elected seat in the United States Senate. ^ a b Sources disagree on the exact date McVay succeeded Clay, with the Alabama Department of Archives and History and National Governors Association mentioning both July 16 and July 17, though July 17 is used more prominently. Further confusing matters, the Biographical Directory of the United States Congress says that Clay's term in the United States Senate began on June 19. ^ Clay resigned to take an elected seat in the United States Senate. ^ a b Sources are evenly split on when Bagby succeeded McVay, with some saying November 21, 22, or 30. However, contemporary news places the inauguration on November 21. ^ Martin was a Democrat who opposed party leaders and ran as an independent. ^ Watts was arrested by Union forces soon after the American Civil War ended; he was released a few weeks later. ^ Sources disagree on Watts' party; the Alabama Department of Archives and History says Democratic, but most others say Whig. ^ Parsons was appointed and therefore did not run for office under a party; he was a member of the Democratic Party. ^ Parsons was appointed provisional governor by the Union occupation. ^ a b Some sources say Patton left office on July 24, after Smith was sworn in on July 14; it is unknown what would cause this discrepancy. ^ Patton later switched to the Republican Party, but ran as a Whig. ^ a b The United States Congress stripped Patton of most of his authority in March 1867, after which time the state was effectively under the control of Major General Swayne. ^ The date given for Swayne is the date of the first Reconstruction Act, which placed Alabama into the Third Military District; all references only say "March 1867" and "when the Reconstruction Acts were passed". ^ In December 1867, President Andrew Johnson ordered the removal of Major General Swayne, and he was replaced on January 11, 1868, by Major General Julius Hayden. ^ a b Lindsay was sworn into office on November 26, 1870, but Smith refused to leave his seat for two weeks, claiming Lindsay was fraudulently elected; he finally left office on December 8, 1870, when a court so ordered. ^ At the start of Samford's term, he was out of state seeking medical treatment; as president of the senate, Jelks acted as governor in his absence. Samford later died in office, and Jelks succeeded him. ^ First term under the 1901 constitution, which lengthened terms to four years. ^ Jelks was out of state for medical treatment for nearly a year; as lieutenant governor, Cunningham acted as governor in his absence. ^ a b c d e f g h i j k l m n o p q r s t u v w x The constitutional start date for 1911 was January 16. However, the Alabama Supreme Court ruled in the case of Oberhaus v. State ex rel. McNamara that, regardless of when the swearing in took place, B. B. Comer's term did not end until the end of Monday, and Emmet O'Neal's term did not begin until the first minute of the next day. This precedent appears to have quietly continued, as contemporary news coverage of Robert J. Bentley's inauguration noted he would not officially take office until midnight. Therefore, governors since 1911 that served to the end of their term are noted as leaving office on Monday, and their successor taking office on Tuesday. It is assumed this did not apply ex post facto to terms between when the constitutional date was established in 1901, and the court ruling in 1911. ^ Brandon was out of state for 21 days as a delegate to the 1924 Democratic National Convention; as lieutenant governor, McDowell acted as governor for two days. ^ Wallace was out of state for 20 days for medical treatment; as lieutenant governor, Brewer became acting governor on July 25, 1967; Wallace returned to the state later that day. ^ Wallace was out of state for 52 days for medical treatment following an assassination attempt while campaigning for President of the United States; as lieutenant governor, Beasley acted as governor for 32 days. ^ Hunt was forced to resign upon being convicted of illegally using campaign and inaugural funds to pay personal debts; he was later pardoned by the state parole board. ^ Bentley resigned from office as part of a plea deal involving campaign violations. ^ Ivey's first full term began on January 15, 2019, and will expire on January 16, 2023. "Alabama Governors". Alabama Department of Archives & History. Retrieved August 1, 2007. "Alabama: Past Governors Bios". National Governors Association. Retrieved November 24, 2018. "Constitution of the State of Alabama". Alabama Legislature. 1901. "Constitution of the State of Alabama". Alabama Legislature. 1875. "Constitution of the State of Alabama". Alabama Legislature. 1868. "Constitution of the State of Alabama". Alabama Legislature. 1865. "Constitution of the State of Alabama". Alabama Legislature. 1861. "Constitution of the State of Alabama". Alabama Legislature. 1819. ^ a b c d e f g h i j k "Alabama Governors". Alabama Department of Archives and History. Retrieved April 10, 2012. ^ Shearer, Benjamin. The Uniting States – The Story of Statehood for the Fifty United States, Volume 1: Alabama to Kentucky. Westport, Connecticut: Greenwood Press. p. 41. Retrieved August 2, 2010. ^ "Thomas Bibb". National Governors Association. Retrieved November 24, 2018. ^ "Gabriel Moore". National Governors Association. Retrieved November 24, 2018. ^ "Clement Comer Clay". National Governors Association. Retrieved November 24, 2018. ^ United States Congress. "CLAY, Clement Comer (id: C000481)". Biographical Directory of the United States Congress. ^ Webb, Samuel; Armbrester, Margaret (2014). Alabama Governors: A Political History of the State. University of Alabama Press. p. 47. Retrieved December 2, 2018. ^ Du Bose, Jose Campbell (1915). Alabama History. B. F. Johnson Publishing Company. p. 357. Retrieved December 2, 2018. ^ "Inauguration". Voice of Sumter. Livingston, Alabama. November 28, 1837. Retrieved December 7, 2018. ^ "Joshua Lanier Martin". National Governors Association. Retrieved November 24, 2018. ^ a b "Thomas Hill Watts". National Governors Association. Retrieved December 7, 2018. ^ "Thomas Hill Watts". Alabama Department of Archives and History. Retrieved December 7, 2018. ^ Thornton, J. Mills (2014). Politics and Power in a Slave Society: Alabama, 1800–1860. LSU Press. pp. 440–441. Retrieved December 8, 2018. ^ Alexander, Thomas (August 1961). "Persistent Whiggery in the Confederate South, 1860-1877". The Journal of Southern History. 27 (3): 305–329. JSTOR 2205211. ^ a b "Lewis Eliphalet Parsons". National Governors Association. Retrieved November 24, 2018. ^ a b c d "Robert Miller Patton". National Governors Association. Retrieved November 24, 2018. ^ "Robert Miller Patton". Alabama Department of Archives and History. Retrieved October 13, 2008. ^ a b "Wager T. Swayne". Encyclopedia of Alabama. Retrieved September 21, 2015. ^ White, James Terry (1900). The National Cyclopaedia of American Biography. James T. White & Company. p. 435. Retrieved January 18, 2008. ^ "David Peter Lewis". National Governors Association. Retrieved December 8, 2018. ^ "William Dorsey Jelks". Alabama Department of Archives and History. Retrieved December 7, 2018. ^ "Russell Cunningham". Alabama Department of Archives and History. Retrieved October 13, 2008. ^ White, David (January 17, 2011). "Robert Bentley ready to take office as next Alabama governor". The Birmingham News. Retrieved December 10, 2018. Bentley under state law won't officially be governor until just after the stroke of midnight Tuesday morning. ^ Owen, Thomas McAdory (1979). Alabama Official and Statistical Register. Alabama Department of Archives & History. p. 17. Retrieved September 28, 2008. ^ "Forrest Hood James". National Governors Association. Retrieved December 8, 2018. ^ Nossiter, Adam (12 June 1997). "Ex-Gov. Hunt of Alabama Cleared by Pardon Board". The New York Times. p. 18. Retrieved September 28, 2008. ^ a b "Don Siegelman (1999-2003)". Encyclopedia of Alabama. Retrieved December 8, 2018. ^ Blinder, Alan (10 April 2017). "Robert Bentley, Alabama Governor, Resigns Amid Scandal". The New York Times. Retrieved April 10, 2017. Wikimedia Commons has media related to Governors of Alabama.